14 Day - Cossack Explorer A tour that combines colour, culture and history. An exciting tour filled with plenty of colour, unique cultures and enthralling history. This tour takes in 11 cities across 7 countries. 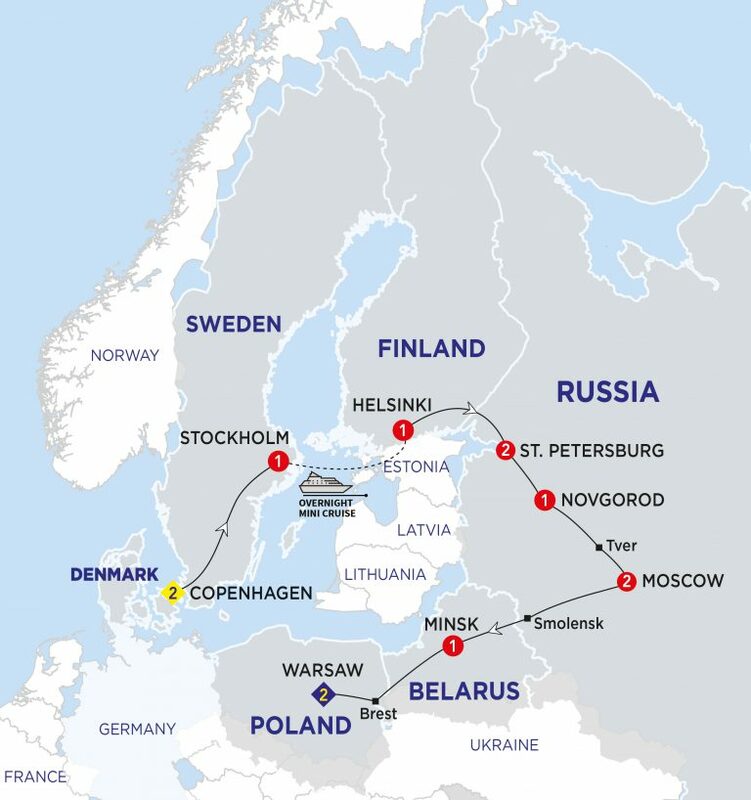 You will visit the splendid Scandinavian cities of Copenhagen, Helsinki and Stockholm, marvel at fabulous architecture in Minsk and Warsaw and be in awe of the imperial capitals; Moscow and St Petersburg. Tour of St. Petersburg with a local specialist. See the Winter Palace, St. Isaac's Cathedral and Nevsky Prospekt including a visit to the St. Peter and Paul Fortress. Your Local Specialist takes you on a morning sightseeing tour which includes the Little Mermaid, the Renaissance Stock Exchange, Royal Amalienborg Palace and Christiansborg Palace. Spend the rest of the day exploring the sights of your choice or shopping. This evening we’ll visit the fairy-tale village of Dragor with its thatched cottages and pretty working harbour. You’ll wander by tiny houses, learn a little of the history and enjoy a taste of traditional Danish specialities. Then on to the magic of twinkling lights at Copenhagen’s most famous attraction, Tivoli Gardens. Travel into Sweden via the spectacular Øresund Bridge, and through lush forests and meadows bordering the shores of Lake Vättern. Continue northwards to Stockholm, Sweden’s beautiful capital surrounded by islands. Enjoy an evening out in a popular local restaurant with its special cuisine and atmosphere, where you’ll savour a delicious dinner and a drink. Admire Stockholm’s biggest landmarks this morning with your Local Specialist, with views of the Royal Palace and City Hall. Built on a maze of islands linked by bridges, Stockholm is an interesting city to wander through. Don’t miss the opportunity to soak up the atmosphere before embarking on your mini-cruise to Finland. Explore with us on a visit to see the Vasa, the 17th century Galleon recovered from the sea bed after more than 300 years and now displayed in an award-winning museum. You’ll also take a walking tour through the Gamla Stan with your Local Specialist, who’ll reveal the old heart of Stockholm with its cobbled streets and fascinating shops. Arrive early in Finland’s capital for a sightseeing tour with your Local Specialist. View Finlandia Hall, the Senate and market squares, the café-lined Esplanade and the beautiful domed Russian church. The rest of the day is yours to explore, shop for souvenirs or relax. Helsinki’s restaurants are featured in every Good Food Guide to the Baltic. Tonight you’ll have seats reserved at a friendly local restaurant, to enjoy delicious cuisine and the specialities of the house in an authentic setting. Join us on a drive through Finland’s countryside towards Hvittrask. Home to Finland’s most famous architects, you’ll see the unique architecture combining natural stone and timber, one of the most accomplished examples of Finnish design which harmonises with the environment. Today we leave Finland to begin our exploration of Russia. We’ll travel along the Gulf of Finland and through the forests of Karelia before reaching St Petersburg, our home for the next two nights. Marvel at the city’s canals and colourful buildings en route to your hotel, where you will dine tonight. The Tsar’s Winter Palace, Nevsky Prospekt, St. Isaac’s Cathedral and the Statue of Peter the Great feature on your guided sightseeing tour. Explore St. Peter and Paul Fortress with your Local Specialist and spend the rest of the day as you wish. You might like to visit the Hermitage Museum or the residence of Peter the Great in Peterhof. Cross the vast Russian plains to the ancient city of Novgorod where you view the Kremlin Fort, Millennium Monument and St. Sophia Cathedral. Dine tonight at your hotel. Moscow is a city full of wonderful buildings and monuments. Your Local Specialist shows you an array of sights including Red Square and the domed St. Basil’s Cathedral. In your free time, consider visiting the impressive Treasure Chamber of the Tsars. Drive past the region of Borodino, site of Napoleon’s great defeat, and stop for lunch near Smolensk. Later cross the border into Belarus and continue to Minsk. After the Second World War the city was rebuilt in supreme Soviet style which you can see during your orientation tour. Dine tonight at your hotel. Traverse the huge plains of Belarus and stop for lunch at Brest on the Polish frontier. Later we arrive in Warsaw, Poland’s capital. Your Local Specialist shows you the site of the Warsaw Ghetto and the landmarks of Warsaw’s Old Town, which was almost entirely destroyed during the Second World War. Later you might like to soak up the city’s culture and nightlife. Poland has a rich culture and famous folk art. On this trip, you’ll have the chance to enjoy music and traditional dance while savouring a delicious meal of homemade Polish specialities. Say goodbye to your Travel Director and travelling companions at the end of your memorable holiday. Transfers are available. Conditions apply.